Explosion-proof, dust-tight and waterproof. Aluminum with removable rear plate. Two explosion-proof sealable fittings supplied. 4-inch diameter and 12-inch length. IP66 rated. 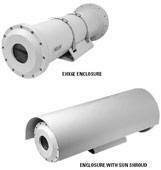 | The EHX*E Series explosion-proof camera enclosures are used in explosive and hazardous atmospheres throughout the world. They are designed to meet the rigorous requirements of explosion-proof and dust-ignition- proof electrical equipment for installation and use in hazardous locations. These enclosures are also waterproof and dust-tight. EHX*E Series Explosion-Proof | The EHX*E Series explosion-proof camera enclosures are used in explosive and hazardous atmospheres throughout the world. They are designed to meet the rigorous requirements of explosion-proof and dust-ignition- proof electrical equipment for installation and use in hazardous locations. These enclosures are also waterproof and dust-tight.